Oh, those people at the BBC Proms are clever. They lure children along to their concerts with talk of Daleks, Cybermen and Silurians, and then, with the consummate skill of the Childcatcher in Chitty Chitty Bang Bang they close the doors and reveal their true motive – to introduce kids to classical music. Of course, as motives go, this is a fairly noble one, and anything that can sweeten this cultural pill to make it easier for young ’uns to transition into orchestral music can’t really be sniffed at. 2008’s sell out Doctor Who Prom proved (as if there was any doubt) that the sci-fi show is a hot ticket, and with arrival of a new production team and cast, it would have been foolish to not try and replicate the success of that hot Sunday two years ago. Cannily, they scheduled two concerts at the Royal Albert Hall this time (Saturday evening - full price, Sunday morning - family priced) to try and meet more of the demand. Again, no great surprise that tickets sold out within no time, and as the long thrall of fans queuing down the steps at the back of the venue, clamouring for the 500 arena tickets, will testify – Doctor Who is something very special, and deserves nothing less than a blockbuster presentation. And that’s exactly what the promenaders got in this 2 ¼ hour spectacular. This fusion of two of the BBC’s biggest brands was… ahem, out of this world. As already mentioned, the feather in the hat for this production was getting hot young things Matt Smith (The Doctor), Karen Gillan (Amy Pond) and Arthur Darvill (Rory Williams) to present the show. This new time team has been tearing up the ratings on Saturday nights, and as the number of fezzes and bow ties in the auditorium showed, this Doctor and his companions are cool. This year also presented the opportunity for new-Who stalwart Murray Gold to showcase his new tunes to a massed crowd. Murray was one of the few people who transitioned from the Davies to Moffat eras of Who, and while some feared that the music would be anchored in the 10th Doctor’s style, they were proven wrong. Gold has delivered some gorgeous new themes and anthems across the season’s 13 episodes, and now was the time (in the absence of any commercial music-only release to date) for the fans to listen to the tunes without the pesty interruption of actors talking, TARDIS groans and exploding Pandorica boxes. Let’s get the classical music out of the way first. Not to do it any disservice, most readers on this site are interested in soundtracks (I guess there’s a clue in the name of the site?) and I have to be honest that my classical knowledge is not what one might expect. So, I’ll park this aspect straightaway, acknowledging that the popular pieces were conducted by Grant Llewellyn and included Holst’s ‘Mars’ from ‘The Planets’, Wagner’s ‘Ride of the Valkyries’, Orff’s ‘Carmina Burana’ and John Adams’ ‘Short Ride in a Fast Machine’ (Not quite fast enough for some of the wriggling youngsters!) The reasons for inclusion were as tenuous as ever – William Walton’s Overture, ‘Portsmouth Point’ was included not only for its sense of adventure but because it’s Murray Gold’s home town – but as a live experience, the performances were superb. OK, enough of the classical stuff and onto the monsters. The stage was set up with the beautiful new Moffat era TARDIS back left, with glowing ‘Police Box’ signs and a gleaming blue coat of paint. After the warning tannoy announcement from a Dalek that people who didn’t turn off their mobile phones would be exterminated (at least, I THINK it was a Dalek, rather than a ropey PA system), Ben Foster took to the stage, leading the BBC National Orchestra of Wales and the London Philharmonic Choir. ‘House band’ National Orchestra of Wales were not used in 2008, and it’s to everyone’s credit that the right orchestra was on the stage this time, playing the scores that they have previously brought to life. ‘The Mad Man with a Box’ was the first cue, and as with the other Doctor Who pieces, was accompanied by onscreen footage from related episodes, transmitted around the Hall on giant screens. Yamit Mamo sang the delicate opening notes before the soaring choir and full orchestra rushed in to show everyone that this was going to be no ordinary concert. Lead writer Steven Moffat made the point at the beginning of the new season of Doctor Who that one of the prevalent themes would be that of fairy tales, and this was certainly reflected in his writing. It’s also evident in Murray’s writing, with fairytale twinkles, chimes and plucking, underscored with a darker edge. Karen Gillan then took to the stage to huge applause and introduced ‘An Untimely Arrival’, which follows Matt Smith’s Doctor’s first close encounter with young Amelia. A splendid counterpoint to the darker material to follow, this is fun carnival antics, music to eat fish fingers and custard to. ‘I am The Doctor’ is the show’s main theme for the season, and you could feel the audience coming alive as the strings launched into it and the first few beats pounded out. 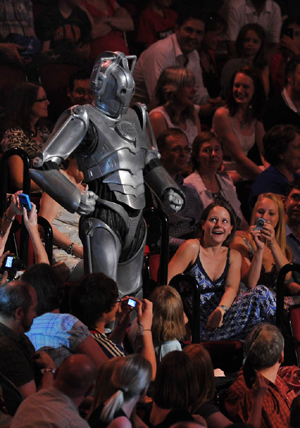 However, instead of just dividing time between watching the orchestra and the big screens, the audience now had Cybermen, Silurians, Vampire maidens and Judoon to worry about too. Stomping, creeping or gliding around the arena and aisles, these popular monsters couldn’t have arrived to a more majestic theme, as thousands of mobile phones lit up to capture these monster encounters. Appropriately, the piece concluded against footage from The Doctor’s Stonehenge standoff against all his enemies. As the ships fly away, The Doctor wins again (for now), while Murray’s catchy new theme will always be winning. Pity poor old Ben Foster. In 2008 he was hassled at the conductor’s podium by a bronze Dalek, and clearly there should have been a clue for him in this year’s ‘Battle in the Skies – Daleks vs Spitfires’. True to form, the metal meanies returned to torment the orchestrator/conductor in the form of the gleaming white Supreme Dalek. Having just ordered an Ironside camouflaged Dalek to descend and prepare for extermination, the leader of the new Dalek master race commanded Ben to start playing, and to leave his sucker arm alone! The piece was from the episode ‘Victory of the Daleks’, a Second World War tale featuring Spitfires in outer space. As you’d expect, Murray lays on lashings of Walton-esque Battle of Britain vibes, adding to the Saturday matinee feel of the episode. After the interval, Gillan’s presenting was interrupted by some apparent feedback she was receiving on her headpiece, and then suddenly The Doctor appeared on the viewscreens, handling a ‘timey-wimey explodey-wodey’ gizmo that was likely to explode fairly imminently. The screen crackled, The Doctor disappeared from view… and he reappeared on the hydraulic lift in the centre of the arena. To have Matt Smith in character for this extra bit of Doctor Who will be a highlight for many, not least the youngster that he employed to help him diffuse the device. Of course, with the aid of his new assistant and the audience The Doctor was able to restore things, though one of the casualties was ITV, which is now apparently off air… Normal service resumed with Amy’s theme and a wonderful medley from ‘The Beast Below’, ‘The Hungry Earth/In Cold Blood’, ‘Vampires of Venice’ and ‘Vincent and The Doctor’ in ‘Liz, Lizards, Vampires and Vincent’. If ever there was proof that scoring this show is the best job in the world, just listen to the opportunities that it presents the composer. Different countries, different time periods and different genres all mean that no two shows are the same, and no two scores tread the same ground. Not all of the music at the concert was from the new season, with ‘This is Gallifrey’ making a welcome return. A sweeping score for a planet that no longer exists, this ode to the Timelord’s home planet was written for the season three finale, and played to great acclaim in the 2008 Prom. Returning for the second Doctor Who Prom, it was accompanied by images of the regenerating Doctors, though a technical hitch meant this didn’t appear in the Sunday concert. Counter tenor Mark Chambers then led ‘Vale Decem’ (‘Farewell Ten’), David Tennant’s dying lament just before he regenerated into Matt Smith. Matt Smith then bounded onto the stage as himself, the Tweed jacket and bow tie tucked safely away for the Christmas special. 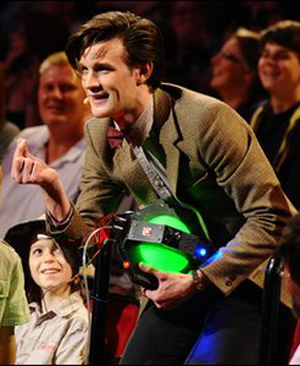 His excitable intro to ‘The Pandorica Suite’ showed his admiration for Murray’s score from the season finale two-parter. And what a score it is, ramping up everything that had already gone before in the season. For sure it’s epic, full-blooded and achingly orchestral, but it’s also in the quieter moments that the full sweep and range of the episodes’ compositions are evident. If the season’s stories were a tapestry of threads, winding to form a complete picture, so too has Murray’s themes wound across the tales, converging at the end and forming this symphony for the Pandorica. The final section was saved for two more favourites – a Who encore if you like. Originally written for ‘Planet of the Ood’, Murray’s theme was developed into ‘Song of Freedom’, a rousing clap-along national anthem for the Whovians that made such an impact in the season four finale. And, of course, what Doctor Who concert would be complete without a rendition of Ron Grainer’s Theme, spruced up for the Matt Smith generation. As the final notes faded away the sound of the rapturous audience drowned out anything that could have been thrown at them. Standing ovations, cries of joy and whoops of admiration were showered on Murray, Ben, Yamit, Mark, Matt, Karen and Arthur, who must have felt like they were on top of the world. Of course, the big question is this – was this year’s offering better than the 2008 concert? True, the first one will always be special because it was the first of its kind and no-one really knew what to expect. But then by having the current Doctor in character on stage could possibly give this one the edge over 2008’s pre-record from David Tennant. Let’s just say that both brought different things to the table, and complement each other perfectly. For those who couldn’t get a ticket, the show was recorded for transmission later in 2010 on BBC3. Oh, and finally, a mention of the programme. Clearly a lot of work and passion went into the detailed articles, penned by our very own Michael Beek. A great piece of Who memorabilia for collectors and concertgoers alike, and while it is beautifully die-cut in the shape of a new uber-Dalek, did we really need to be tempted by FIVE different covers, one for each of the new Dalek colours? Perhaps the plan was for children to choose their favourite Dalek, or maybe a cynical attempt to increase programme sales five-fold? Which one did I get? All five, of course!